So. darn. chic. Do you like this part of the 90's style revival? It's definitely one of the more subtle trends to come out of such a flashy decade, and as a product of the 90's I feel like I need to give it a try. Cheers! As you can probably tell by my blog name, I love a traditional looks with a modern twist. One of my favorite variations of this that I've come across recently is the matching separates trend. Usually I really dislike over-done 'matchy matchy' outfits, but these sets manage to come across decidedly cool rather than cheesy. Have you delved into this matchy look? Unlike some trends I find it really wearable and can definitely see it continuing into fall with heavier fabrics, longer sleeves, and booties. Which of the three categories would you choose? Hope you're having a lovely Monday! Ah, we've reached the end of my NYC posts. I have to say I'm sad to see them end- it was so much fun reliving this adventure by sharing it with y'all! The last day of our trip was relatively short since we had to be at the bus by 3:30pm, but the weather was idyllic and we tried our hardest to make each minute count. The highlight of the day was spending a leisurely three hours exploring The MET on the Upper East Side. As a long time Gossip Girl fan (own all the books & dvd's #guiltypleasure) I've always loved visiting the MET and pretending I'm Blair Waldorf. I love that no matter how many times I visit there's always something new to see and another area of the building to explore. The inside of the museum never fails to amaze me. Everywhere you turn there's something just waiting to take your breath away. One place I was determined to visit was the Egyptian Wing that's featured in one of my favorite movies, When Harry Met Sally. The giant window was gorgeous on the bright, sunny day and the natural light was filtering in so beautifully. My favorite new discovery of the day was definitely the Charles James: Beyond Fashion exhibit. The room features his beautiful sculptural gowns and quotes about fashion on mirrored walls; combined with the low lighting there was definitely a magical glow about the room. It's only running until August 10th so if you find yourself in the city before then (and love fashion/history) you must go check it out! Despite the beauty inside the museum, the absolute best part of the visit was finally visiting the museum's rooftop in person! I had seen so many gorgeous photos on the 'Gram of this location, and thanks to Brooke's emphatic recommendation we knew that we simply couldn't miss the amazing views of the city from this vantage point. Wow was everyone right! It was a cloudless, breezy day and the city was definitely showing off for us. There were so many people up there enjoying the weather and I could have easily spent the rest of the afternoon there if we hadn't had to leave to catch our bus. The dress I wore that day (which my roommate so nicely let me borrow!) was perfect for walking around the Upper West/East Side and Central Park; comfy, but still had a 'put together' vibe. I just love its unusual color and swingy, tiered shape. I'm definitely on the hunt to find one like this for myself! Thursday was another great day in the city replete with fabulous, unforgettable adventures. Here's a photo-heavy look at our last full day in the big apple! 9:00 am- Em and I decided to forego the first part of the day at the SGGC in favor of a leisurely breakfast at The Smith. I had heard such great things about this non-nonsense restaurant online and we knew we just had to check it out for ourselves. The Upper West Side location was nothing short of picture-perfect and the oatmeal was divine. Everything was so visually appealing we couldn't help but snap tons of photos (which our waiter may or may not have caught us doing.. #whoops). 10:15 am- We walked the couple of blocks up to Fordham past The Empire Hotel (sadly no Chuck Bass sighting) and Lincoln Center. Of course we had to take advantage of the strangely empty streets to get some outfit pics! I loved my outfit for the day- comfortable and simple, yet chic. 7:15 pm- After the conference (and a stop at J. Crew) we quickly changed clothes and hopped on the subway in pursuit of lower Manhattan. The last time I came to the city the 9/11 Memorial was still in the process of being built so seeing it in person for the first time was quite impressive. It really is a beautiful tribute to the people whose lives were lost on that tragic day. 8:30 pm- Our last adventure of the day was walking The Brooklyn Bridge at sunset. In all the times I've visited the city I had never ventured to Brooklyn and I'm so so so glad we decided to do this- it was the perfect way to round out our trip. The views were completely breathtaking and it was amazing seeing the city all lit up from this perspective. I didn't think it was possible, but it really made me fall even more in love with this crazy place. 9:15 pm- We got to Brooklyn and immediately set out in search of food which we found relatively quickly thanks to Yelp. We arrived at Siggy's Good Food exhausted and starving and I'm not sure food and water have ever tasted so good. I highly recommend this quaint little place if you find yourself across the bridge- fresh/organic ingredients, a friendly staff, and an overall cozy environment (the veggie burger is not to be missed!). Now that you've read about day one of our trip and my experience at the Smart Girls Group Conference I thought I'd share what we did on day two! We really packed a lot of things in a small amount of time on Wednesday (and Thursday) since the SGGC took up the majority of the day. I was really pleased with everything we were able to accomplish even with our later (5pm) start! As soon as the conference ended on Wednesday we quickly changed clothes and set out for the Upper East Side. Our first stop was The Plaza Hotel- one of my all time favorite places in the city. I always stop in whenever I visit to and it never fails to make me feel like a princess. I'm a huge Eloise fan (anyone else obsessed with her Christmas movie??) so finally seeing her portrait was too much fun. Of course I had to get a picture with one of my childhood (and adulthood #letsbereal) favorites! After oogling the KS store to our hearts content we hurried back toward midtown to take a peek in Grand Central Station and the New York Public Library; both were beautiful! As an architects daughter I've always had a deep appreciation for well-designed buildings and these two are some of the prettiest I've witnessed. From there we subway'ed further downtown for dinner at the The Grey Dog. (Sidenote: I'd definitely recommend the sangria and the seared tuna/avocado taco. So, so good). Even though it was dark by the time we finished dinner I was determined to walk The Highline. We made it there about 45 minutes before it closed for the night and it was so worth the hustle to get there! The landscaping combined with the views of the city all lit-up and the nearly full moon made for a beautiful stroll (although, I'm pretty sure the three of us were the only people up there that weren't in a relationship). If you're in the city with your significant other it's definitely a romantic spot at night! Attending the first annual Smart Girls Group Conference was easily one of the best choices I've made in my life. It pushed me out of comfort zone, helped me network and meet new people, and filled me with inspiration and ideas for the future. It makes me so happy when my ideas are actualized, and this was definitely goal-fulfilment in the best possible way. Blogging/writing/digital media is typically just part of my life, and because I started my blog while I was still a student it has always taken a bit of a backseat to my school work. 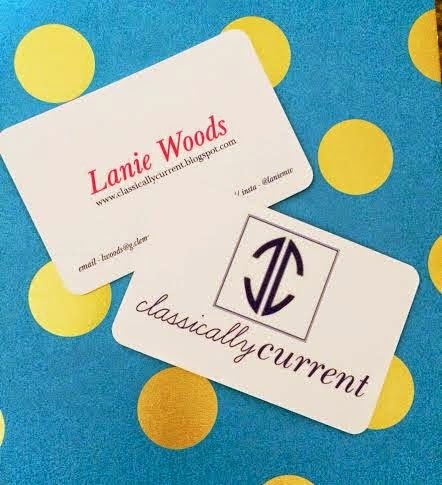 However, at the Smart Girls Group Conference I finally got to focus on being 'Lanie the aspiring digital media journalist' rather than 'Lanie the student'- and it was awesome. Being able to throw myself into something I'm so passionate about was such a blessing and I'm so grateful that I had this opportunity to grow and learn even more about myself and my future career. Being around like-minded young women who are overflowing with passion and purpose was a breath of fresh-air. In college you're surrounded by people with such diverse interests and you rarely meet someone who enjoys/wants to pursue the exact same path as your own. While diversity is a great, it's also hard to keep plugging along at your dreams without having someone who relates to you on a career level. As young women I believe it's our responsibility to support each other and continuously bolster the accomplishments and passions of those around us (both IRL and online). Having a community of people who know why you love to do what you do and care about helping you achieve your goals is so necessary, and this is exactly what the Smart Girls Group Conference was. Emily and I were definitely some of the oldest people at the conference and it was amazing to talk to girls in high school who have already accomplished so much and were filled with so much direction and drive. At their age I was barely cognizant of what I wanted to do in the future, much less taking direct steps in order to guarantee that I would achieve it! It just goes to show that you can inspire anyone and take steps toward your career goals at any age. The women who spoke at the conference were phenomenal and had such interesting, intelligent things to share. Being in the presence of strong, self-assured women never ceases to renew my passions and sharpen my desire to accomplish anything I set my mind to. I left with an abundance of ideas from each different woman and their advice and insights were enormously helpful. The cherry on top of an already wonderful conference was getting to meet two of my favorite bloggers. Even though blogging is a digital medium, when you read someone's writing for years upon years you come to feel like you know them. After seeing them online so frequently, chatting with Carly and Mackenzie face to face was a bit surreal; they were both so kind and down to earth that it made me respect them/their blogs even more! Wow- what a week! My brother and I got back home from our exhilarating/exhausting road-trip to the gleaming city of New York late Saturday night and I've been in recovery mode ever since. After four straight days of walking miles upon miles my feet have definitely seen better days #thankgoodnessforbandaids. Our trip went something like this: 9 hour drive from South Carolina to DC, 5 hour Megabus ride to New York then the same thing (in reverse) three days later. I love love love to travel and experience new things and places, but whew I am exhausted! We really had a phenomenal week and I'm so full of gratitude for everything we were able to do and the time we got to spend together. We packed so much into our six day jaunt that I've decided to break it down into a few different posts so it's easier to digest! We arrived in the city around 10am Tuesday morning and after dropping the bags at our hotel we hit the ground running. Our hotel was a block from Central Park and an equal distance between Columbus Circle and The Plaza which is where we headed first. After a stroll through the park we grabbed a quick lunch while waiting on my friend Emily to arrive then the three of us headed downtown. One of the absolute highlights of the afternoon spent downtown was getting to explore the gorgeous Club Monaco store on 5th Avenue. The white marble, plush furniture, pastel colors, and pops of lush greenery everywhere made me weak in the knees. The decor combined with the store's in-house Toby's Flatiron Coffee shop and Strand bookstore made me seriously giddy- I'm pretty sure I could live there for the rest of my life and be perfectly happy. Clothes, books & good coffee- what more could a girl ask for? We continued further downtown toward Washington Square Park and walked past some picture perfect townhouses in the village that looked straight out of a fairy tale. It felt like a different world than the crazy, bustling energy of midtown. If I ever moved to New York I could definitely see myself living there! We went back uptown near the hotel for dinner and stumbled upon a fabulous place called The Little Beet. Everything was so fresh and the branding was seriously adorable. If I lived in the city I would easily eat there at least twice a week. Anywhere with quinoa, kale, and sweet potatoes on the menu has my heart. After eating we rounded out the day with a visit to one of my favorite NYC landmarks, Rockefeller Center. Hey y'all- hope your holiday weekend was fun and relaxing! Brandon and I had a great time beaching it in Tybee and hanging out with our families. I'm just stopping in today to let y'all know I won't be posting this week for a couple of reasons- 1. I accidentally left my computer charger at my apartment (4 hours away) last week, and 2. I'll be traveling to Washington DC and New York City until next Sunday! My brother and I are heading north today and making the 8(ish) hour drive up I-95 to DC then heading to the city bright and early (as in 5am - woof) on Tuesday! 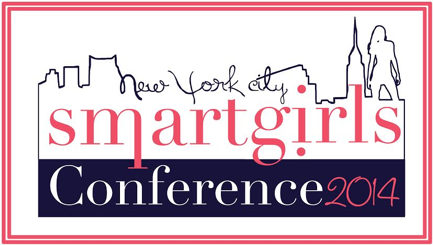 The word excited seems insufficient to really explain how much I'm looking forward to re-exploring one of my favorite cities and attending the Smart Girls Conference! Fun, learning, and adventure all in one trip = a very happy Lanie! Happy Fourth y'all! I'm loving that the holiday falls on a Friday this year. I'm looking forward to spending the weekend exploring Tybee Island, a sleepy little beach town near Savannah Georgia, with my boyfriend. I haven't been in a couple years and am excited to go back! I styled the tee with light wash jeans, a pendant necklace, and my trusty platinum Jacks for a simple, classic look that would be perfect for any low-key gathering. Hope your holiday weekend is full of barbecues, fireworks, fun, and an excess of American pride! I can't contain my excitement any longer y'all... I'm happy to announce that I'm going to New York next week to attend the first ever Smart Girls Conference on July 9th and 10th! After going back and forth I finally bought my ticket last week and I'm still in disbelief that I'm actually going back to my favorite city! The two day conference schedule is packed with fabulous sessions like "How to achieve your dreams by 30" and inspiring guest speakers from Jill Abramson and Lauren Bush Lauren to my favorite bloggers Carly Heitlinger and Mackenzie Horan, and so many more! I'm already feeling inspired and I haven't even left South Carolina yet. I know I'm going to learn so much and have an amazing time networking and getting to know the other attendees and speakers! This is a once in a lifetime opportunity and I feel so lucky to have the chance to have this experience. 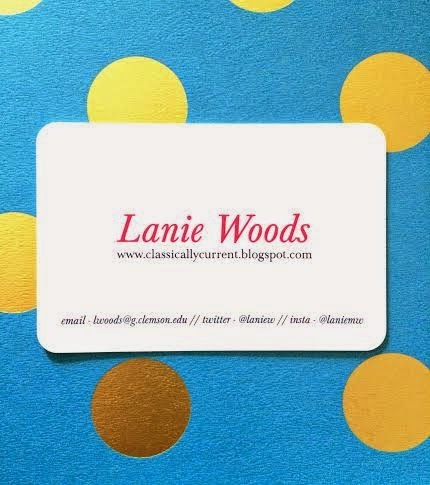 In preparation for the conference I finally bit the bullet and ordered blog business cards. I designed mine on Moo.com on Tuesday and by Saturday they had already arrived! I'm so pleased with their customer service and the thick, sturdy quality of the cards themselves. The colors and rounded edges are just adorable. Let me know if there's anything we absolutely must do while in the city! I've been before (read about my previous trips here) but there are always new things to do and explore in NYC.